Speed Review: Where's Your WOW? 16 Ways to Make Your Competitors Wish They Were You! Whether it is for yourself or for a product or service you sell or for your business, you need to be extraordinary to be seen and heard amid the tumult of the marketplace. You need to find your Wow and then use it to push yourself into the spotlight. 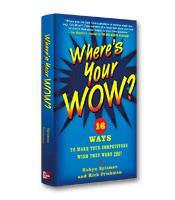 The authors provide 16 concepts that are essential to building Wow. Several engaging examples illustrate their points. We’re all familiar with the word “Wow.” We’ve read it, heard it, said it, perhaps even very loudly, but if asked to define it, we might find it hard to pin down. We might say that Wow denotes something special, memorable or noteworthy. Often Wow seems to describe an intangible quality — that indefinable something that makes a person or thing especially worthy of notice. In fact, the idea of Wow can seem so intangible that we have a hard time determining if we ourselves possess it. Sure, we can point to the companies and individuals that posses Wow — Apple, Oprah, MySpace — but it’s hard to explain exactly what their Wow factor is, and even harder to figure out how to garner some of that Wow for ourselves. For each concept, the authors provide a plethora of real-world, engaging examples to illustrate their points. They cite Jill Conner Browne, author of the best-selling Sweet Potato Queens series and head of the related merchandise and fan club empire, as a model for envisioning your success. The authors describe how Browne’s journey to Wow began while she was riding in the back of a pickup truck in a parade and beginning to picture a way to do fun things like that for a living. Jared Fogle and the famous diet that put Subway on the fast-food map show how truly successful companies identify what benefits their customers and make that benefit a priority. The authors also cite Dr. Henry Heimlich’s creation of his anti-choking maneuver in 1974 as a terrific example of timing and examining what is going on in the world to find a need to fulfill. Heimlich, a successful chest surgeon, read an article in The New York Times about how choking was the sixth leading cause of accidental death, and from that spark came his life-saving Heimlich Maneuver. Perhaps because Wow is a subjective concept, despite the fact that the authors make it quite clear that there is a definite path to achieving it, some of the advice in Where’s Your Wow? can come across as slightly naïve. Of course, we all believe there is something special about ourselves, but not everyone possesses Wow. Still, the authors provide an excellent source of ways to identify and capitalize on uniqueness in a crowded marketplace. Besides, it would seem out of place for a book like this not to be part cheerleader even as it delineates the how-to of Wow.